Ted Grimsrud. 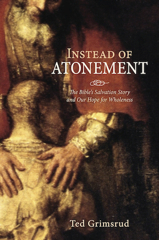 Instead of Atonement: The Bible’s Salvation Story and Our Hope for Wholeness. Cascade Books, 2013. x + 270pp. For more on this book, including purchasing information, follow this link.